Here you will find information related to our school. Please call the school office at (734) 878-5616 with any questions. Please click to hear a message from Bishop Boyea about the scholarship that is available to school families Kindergarten through 12 grade. All applications are due by March 1, 2019. Please take the time to review our handbook for the 2018-19 school year with your child(ren). Once your review is complete, please print and sign the declaration form. Both parents and student(s) must sign the form on the first page. The application and essays may be dropped off at the school office or mailed. Applications need to be submitted to the committee by Friday, May 11, 2018 and recipients will be notified on or before June 1, 2018. To login to our PowerSchool student information system, you will need to have your student(s) access ID and access password. If you do not have this information, please contact the school office at (734) 878 5616. Please login to Smart tuition’s website to view your account information. 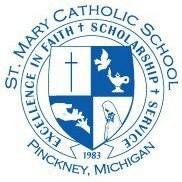 Find out about what’s going on at St. Mary School by reading the St. Mary Marian Messenger.